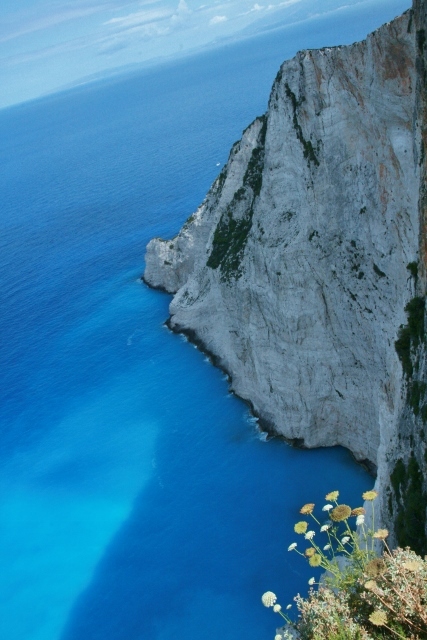 We all have our bucket list and one item on ours was to visit Shipwreck Bay, officially Navagio Beach. We were not expecting the right weather to sail to Shipwreck Bay and it is too deep for most yachts to anchor. It has been blowing Norwesters (30 knots) every afternoon, much like a Sydney Southerly Buster and we didn’t want to join the wreck. We tried to book onto a catamaran tour for the morning, but we could never raise the charter company. 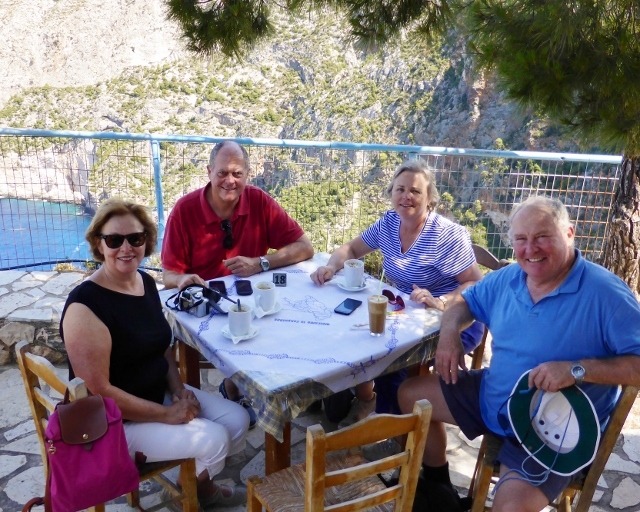 In the end, we spoke to Yannis and took a car up to the viewing point to get an aerial view of the bay and a tour of Zante Island. We weren’t disappointed with our aerial viewing, we had it on good authority “le water is colder than zee witch’s breast”. The blue milkiness of the bay is from Limestone ‘pearls’ creating a swirl of aqua water, so the water is more translucent than clear. 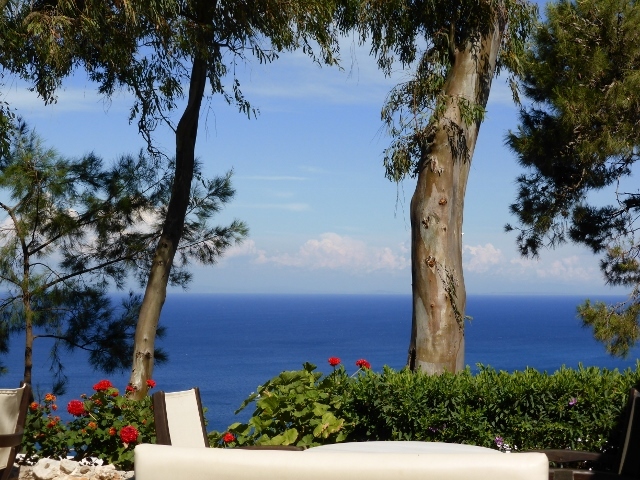 The colour is certainly one we think of when we think of sailing azure seas. 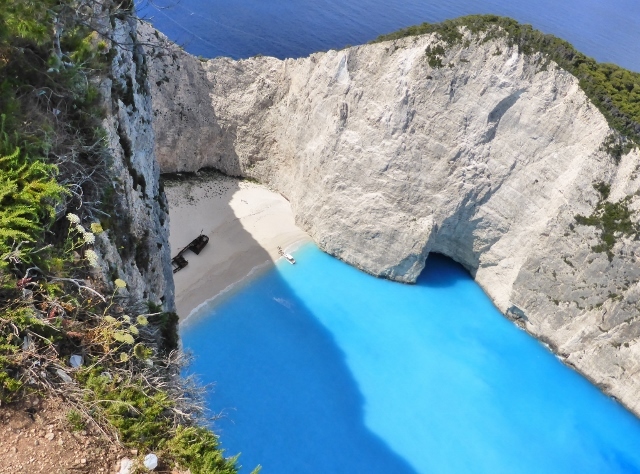 For future reference, if it was warmer and you wanted a swim, our mate John from Zante suggested we drive to Porto Vromi and take a small boat to nearby Shipwreck Bay. If you are 21-30 take a party boat, but take sunscreen and a hat because it’s a long day. Heikell says the Shipwreck was a cigarette boat, a smuggler’s boat to bring in tax-free cigarettes, which wrecked while evading the Coast Guard in a storm. 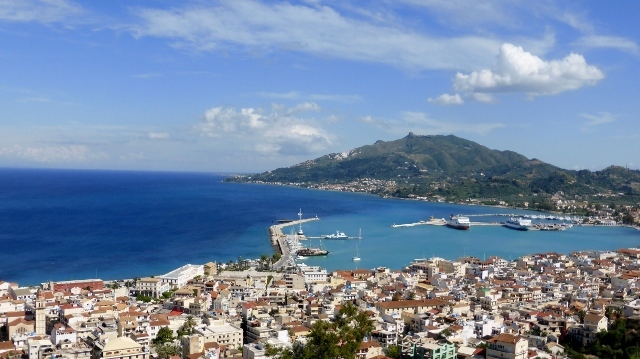 John, Greece’s biggest Cat’s fan, says it might have been set-up to glamorise the most beautiful bay in Greece for tourism. It is so stunningly beautiful, it is hard to imagine they needed to improve the story line. We came back past olive trees, that were almost 200 years old, rustic villages and pine forests. We stopped for coffee at the top of another wonderful bay. The view and colour of the water were remarkably brilliant. We finished the day at the Venetian Fortress at Bohali. We expected the Fortress/castle to be a small hill-top ruin but it is extensive and both the British and the Nazi’s had taken the Venetian’s work and reused it. 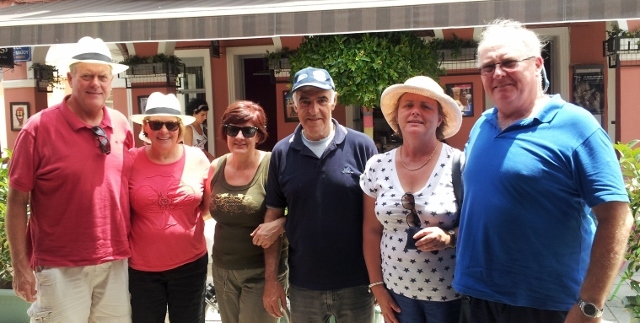 We saw evidence of a British football pitch and the Venetian’s garrison prison and many wells. 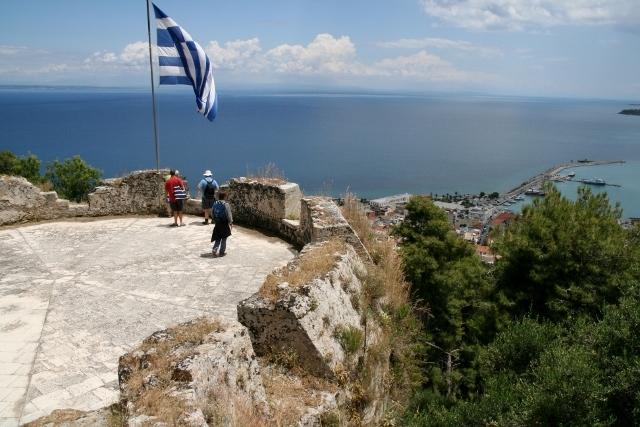 There was a large bastion overlooking Zakthynos Town but from every side of the formidable fortress walls, the views were extensive. It is well worth a trip. We went for a walk after dinner and said goodbye to our friend, John. He asked us to let the Cats know he was barracking for them. So for John, ‘Go the Cats’.